Tim Gange - Mowbray & Son, Inc.
Tim Gange graduated from Minot High School in 1998. He served in the United State Marine Corp from 2001-2006. Tim was also a member of the U.S. Marine Corp Reserve from 2006-2010. He started his career as an Apprentice Plumber, working on a 2-year housing project at the Minot AFB. He worked for two local plumbing firms in Minot from 2006-2015. 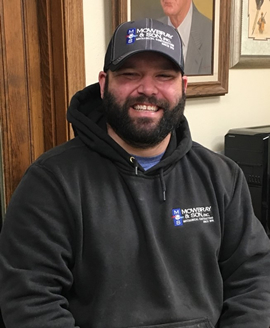 Tim joined the Mowbray & Son Inc service team in May of 2015. Tim is a licensed ND Journeyman Plumber, a certified Med-Gas installer/brazer, and holds certifications in Universal Refrigerant, OSHA-10, First Aid, and CPR.